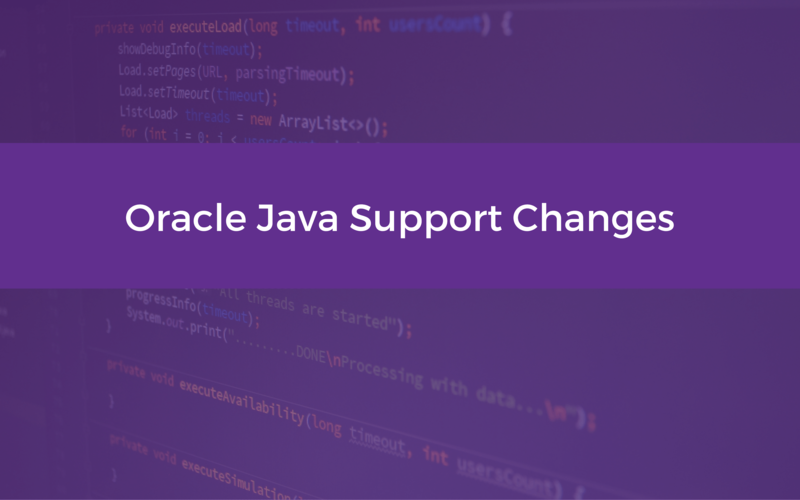 Oracle is changing the way that Java SE is supported and unpaid support for Java SE will cease. Support for commercial users will continue until at least January 2019, but many Java commercial users use Java SE for business commercial production purposes as part of a Java application developed in-house or provided by a third party rather than as part an Oracle product. Unpaid support will continue until at least December 2020 for personal users, these use Java SE on personal desktops or laptops. Personal users also include those using Java SE to develop applications for hobby or educational purposes, play games or run consumer productivity applications. Oracle is also introducing a subscription licence instead of the current licensing model for Oracle Java SE. In conjunction with this, Oracle says they are simplifying licensing by producing open JDK builds released under the same license as LINUX and keeping these alongside the supported builds. This means there will be two parallel tracks of Java software – a free public track and a paid for commercial track. The move to subscription licensing simplifies Java to two products on a 1 to 3-year subscription term; the Java SE Desktop Subscription licensed by users and the Java SE Subscription licensed based on the server. ​Anyone who has bought a new Java SE subscription are covered for the term of the subscription. Those who already have Java support contracts for either Java SE advanced, Java SE advanced desktop, Java SE suite or Java SE support. the related support will continue as usual, you don’t need to do anything. However, if you are thinking of buying more licences you will have to look at subscription licensing, as the old product licences won’t exist anymore. Customers who have purchased an Oracle product which includes Java SE support entitlement, such as most Oracle middleware and application products. You can download the Java SE updates, patches and tools for use with a licenced Oracle product, but you are only entitled to download the versions as required by your Oracle product. That means that in most cases you are expected to download and install the updates and patches only to the servers licensed to use the Oracle product, and to configure it to be used only with the Oracle product. ​Firstly, a custom client application based on Coherence libraries, which is used to access a licensed Coherence back end. The Customer is entitled to download and use Java SE updates and patches to run the Coherence client application. Secondly, where the customer has built a custom client application that uses HTTP to talk to perhaps WebLogic Server, then the customer is NOT entitled to download and install Java SE updates and patches on the client, because the client application is not using a product-specific protocol. The cost of a Java SE Desktop Subscription is $2.50 per Named User Plus per month, for between one and 999 users. Pricing is tiered to reduce with volume and there are no minimum user numbers. The server-side Java SE Subscription, for between one and 99 processors, is $25 per month and again this reduces with volume purchases. For your Java SE Subscription you get an enterprise wide, term-based subscription model including cloud deployment, server and desktop licensing and support. You have access to current and legacy Java SE binaries, access to the Java SE commercial features, as well as performance, stability and security updates. The licence gives on-premise use and access to cloud workload, for your internal use. You also have access to MyOracle support.